Gran Turismo has long prided itself as a series built on realism, but how do you go about modeling that realism? Let's compare a lap done in a real car to a lap done in a fake car, see how they stack up. 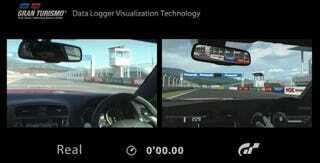 This is a feature from Polyphony Digital on the game's "Data Logger Visualisation Technology", tech which allows the developers to accurately track (and recreate) the movements of not just a car, but its driver as well, uploading them into the game as replays or even ghosts to race against. Seeing the two side-by-side, it makes you wish GT actually included all those bumps.